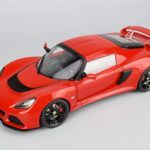 Our latest review comes from the AUTOart brand, the car comes from their composite line of models. 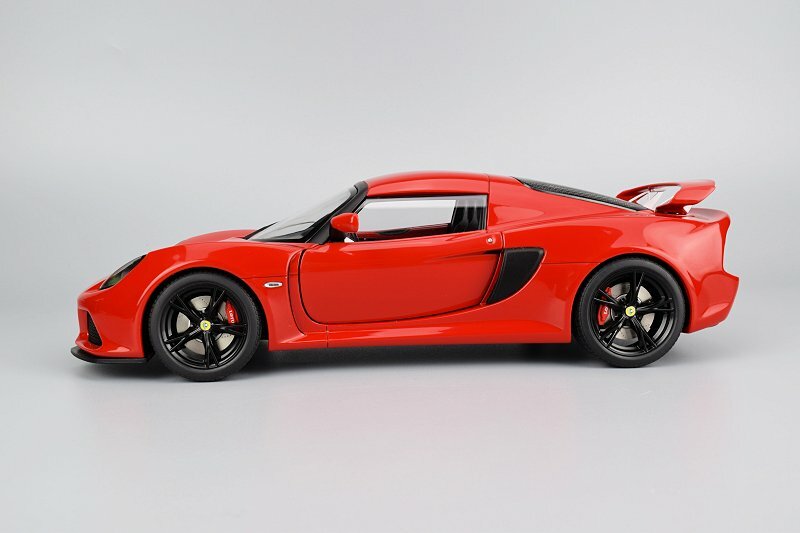 The car in question is the 1:18 Lotus Exige S; our example is found in Red with Black wheels. 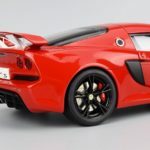 Two other colours are available, they include White and Yellow. 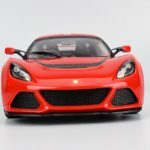 There wasn’t much fanfare or articles written about AUTOart’s replica, though we here at DiecastSociety.com do appreciate Lotus street cars, so any opportunity to review is welcome. 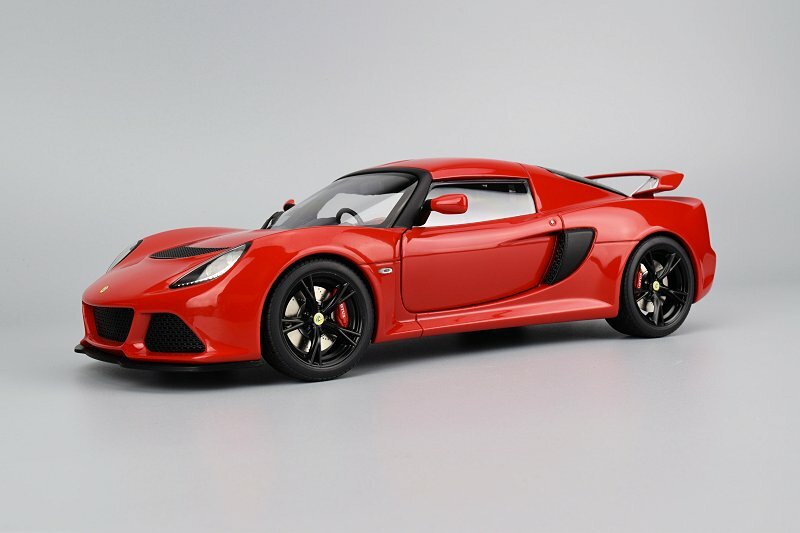 A little about the Lotus Exige, the platform came to life in 2000. 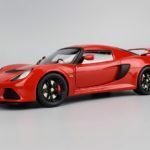 In 2006 Lotus announced the Exige S model, which used a supercharged Toyota engine producing 220 bhp. 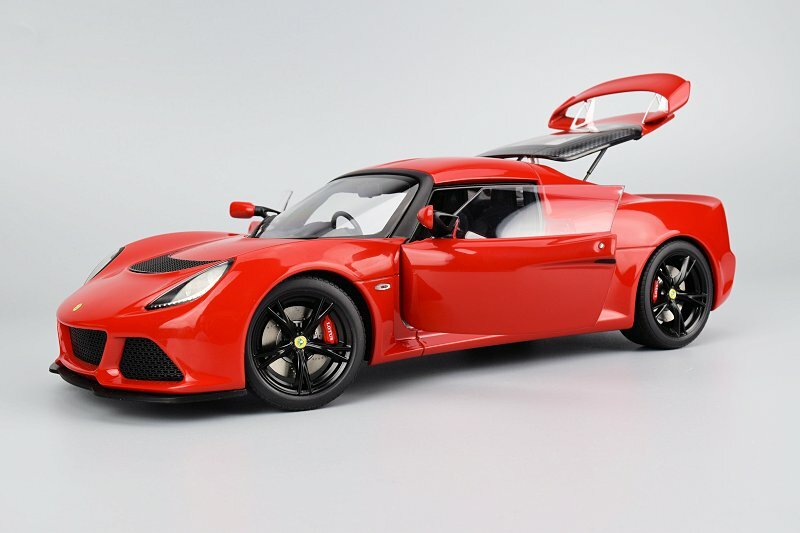 By 2007 the S model was also made available in North American markets. We mentioned earlier our example is found in Red. 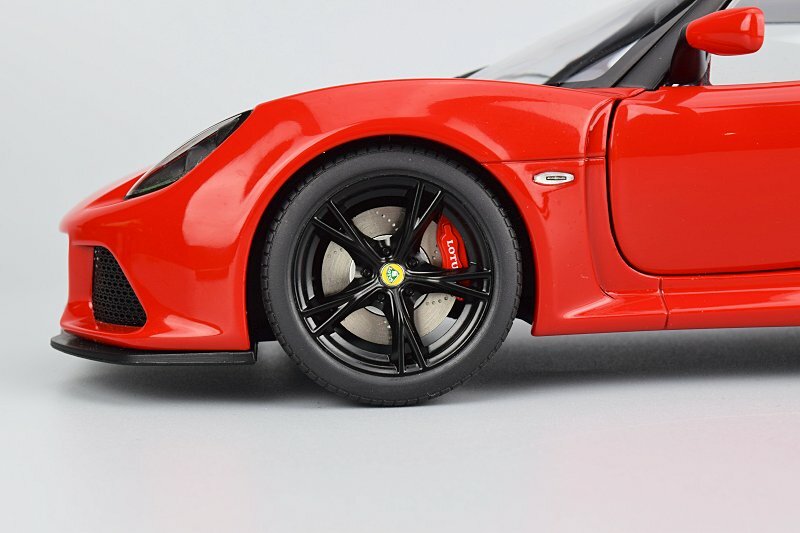 With the added Black wheels and accents bits these colours really work well and produce an attractive package. AUTOart’s paint work is solid here. 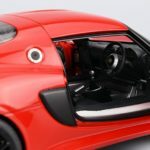 Shutlines and panel gaps are very good – access to interior and rear motor are standard. No access to the front section and roof is fixed and not removable. 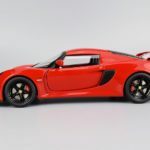 Viewing images of an original Lotus Exige S, our team agrees the overall integrity of the lines and design are replicated well in scale. 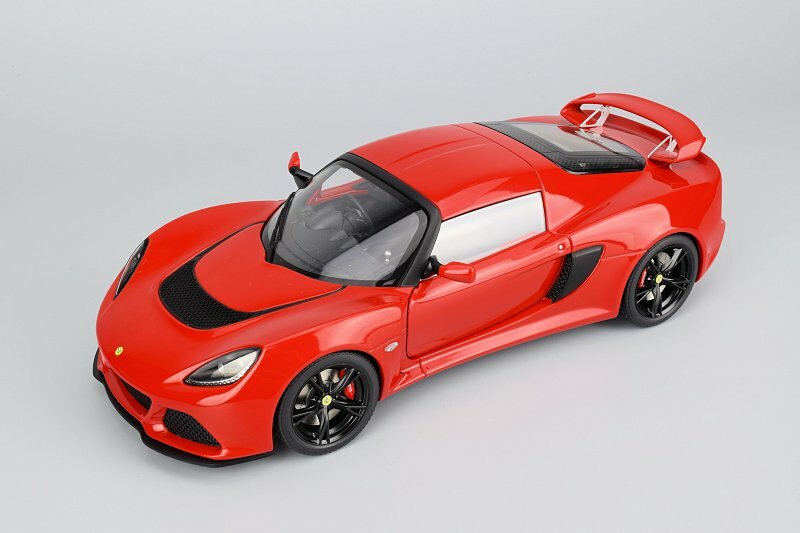 The front of the Exige S features perforated mesh grilles on the lower bumper section and is mirrored in the hood. Execution here is excellent. 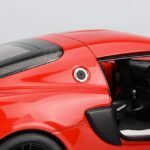 Headlights are nicely crafted with very good detail and materials. 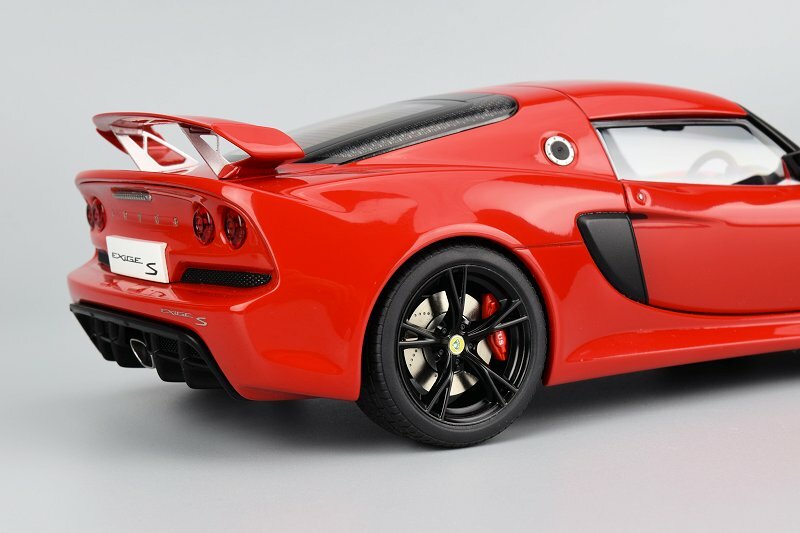 The front Lotus emblem is quality as well. 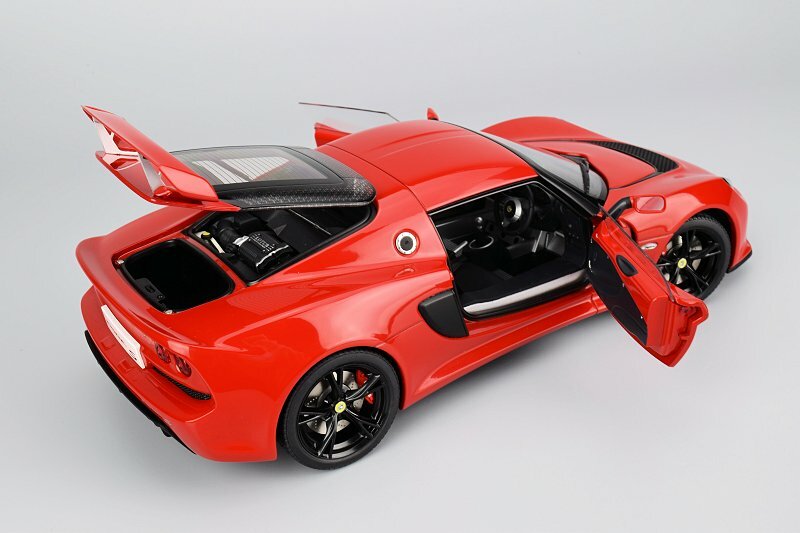 The team also fitted mesh in the large side intakes just behind each door. We like the little things! 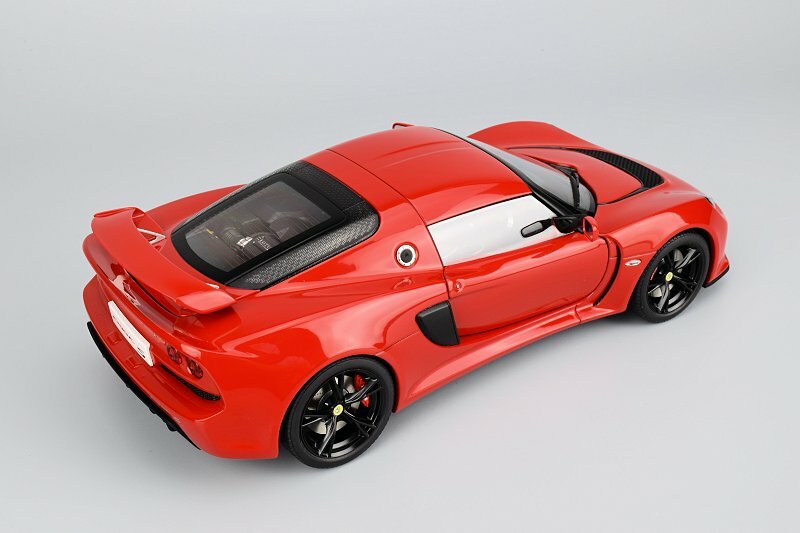 The rear is the Lotus Exige S is much like the front. Perforated mesh is used within the lower bumper area. Excellent depth and detail on the centre exhaust tip too. 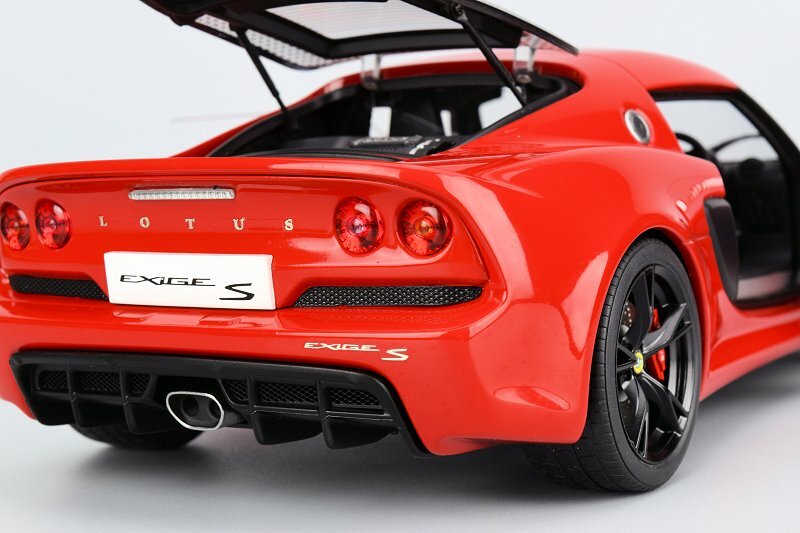 Taillight materials are made with quality plastic and final the Lotus script and badges are nicely defined too. 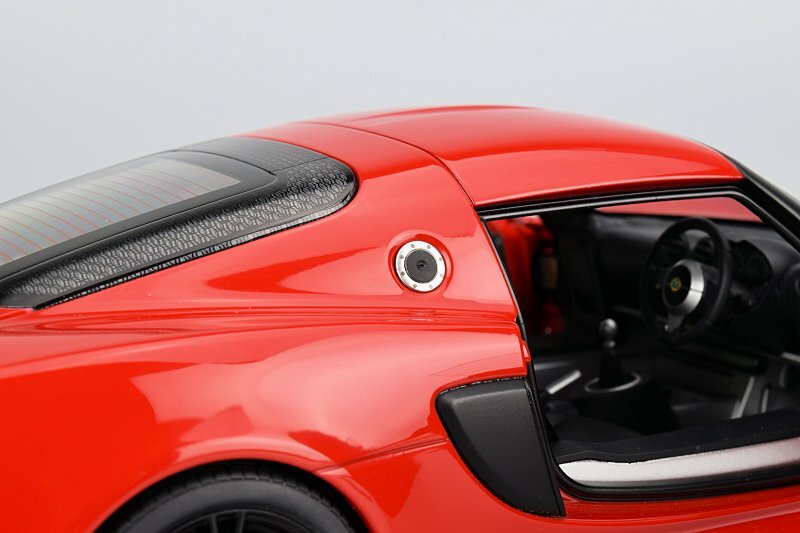 The only solid plastic pieces are the two just under each set of taillights. The motor is accessible here, before we elaborate here in detail, we like to comment on the hatch itself. Operation is flawless and each side is supported by an actual strut. 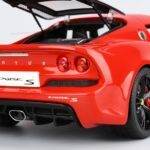 Where it fails in the integrated cooling mesh that surrounds the perimeter; AUTOart choose to replica this will plastic and decal stamping. Though it doesn’t look horrible it does detract from the overall quality standards of the piece. The motor itself is not bad at all. There are layers to the various elements of the motor design. Some colouring is also incorporated into the design which adds to the realism. Overall we rate it a solid B+. 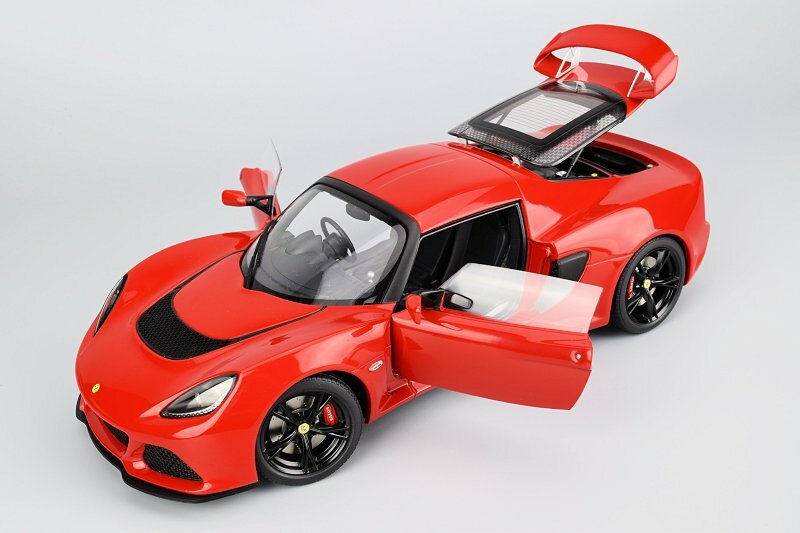 There is a small storage area that is created in solid plastic; the original car is lined in carpeting. Moving to the wheels you can see from our images these are solid efforts. 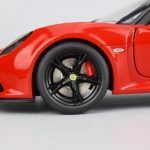 The Black paint is well done and the quality from the accompanying rotors and calipers all produce an excellent package. 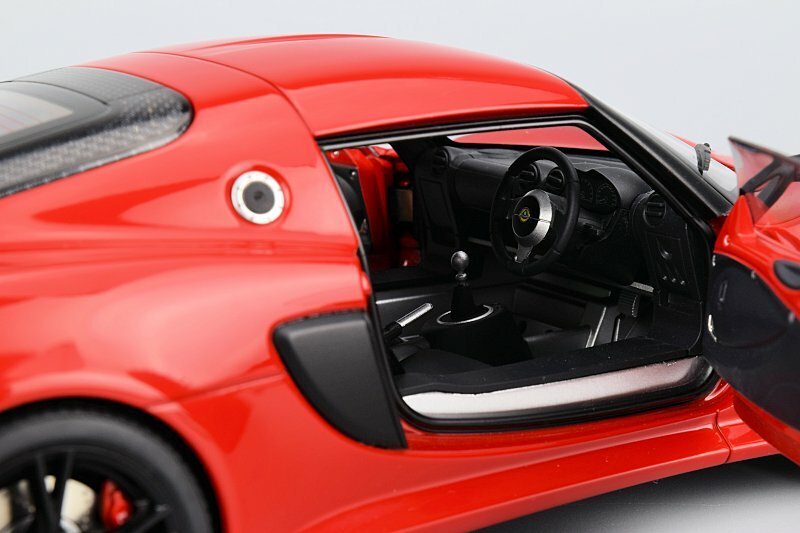 The Lotus Exige S interior is very industrial and minimalist in design. 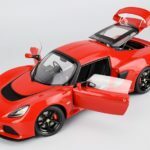 AUTOart does a nice job in creating each element; this includes dash, steering wheel, centre console, seats and door cards. Though the materials in creating these various elements are good and above average, the textures are somewhat weak. No real biggie. 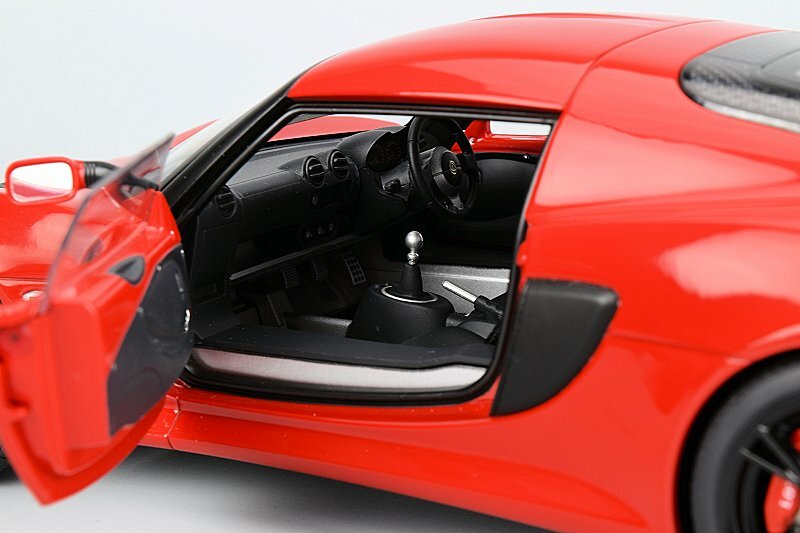 We must add door operation is flawless and authentic cloth seat-belts are included too. 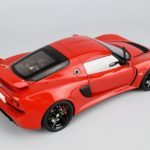 We must say we were pleasantly surprised in the overall solid execution of the Lotus Exige S from AUTOart. Outside and inside the model does provide a good feel. Great lines and colour combination do provide a great view on its own or within a collection. On the flip side there are a few cost cutting measures we mentioned, thankfully not huge in flaw is somewhat positive. 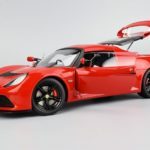 We suggest you take a look at this 2017 release form the AUTOart. Pricing is very attractive too. Enjoy the pics! 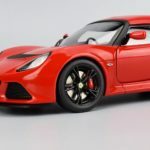 4 Responses to "REVIEW: AUTOart Lotus Exige S"
Was this not released a while back? Or was it a different shade of red? It was released sometime in 2016 I believe. So this is the plastic version? 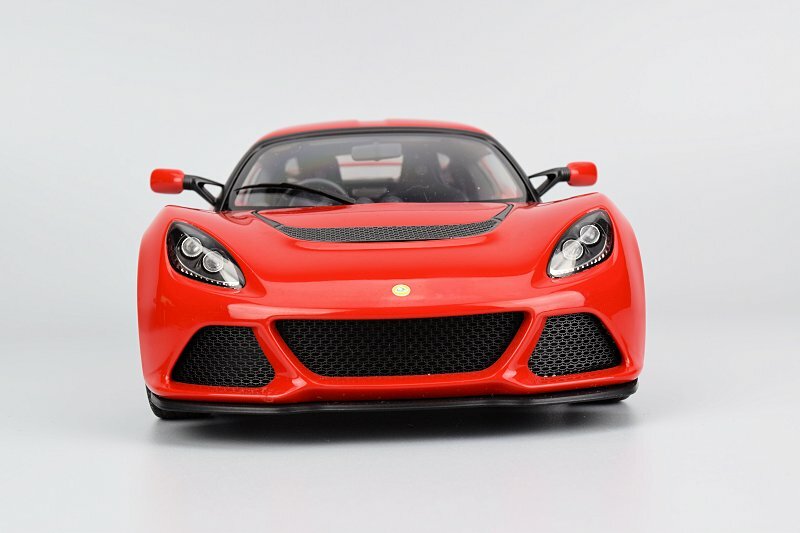 AA is really getting lame… I mean they have Diecast version of the exact same car! Probably cheaper than this ‘New’ one. They could at least done an upgraded model like sport 350 or cup 380 or something new. 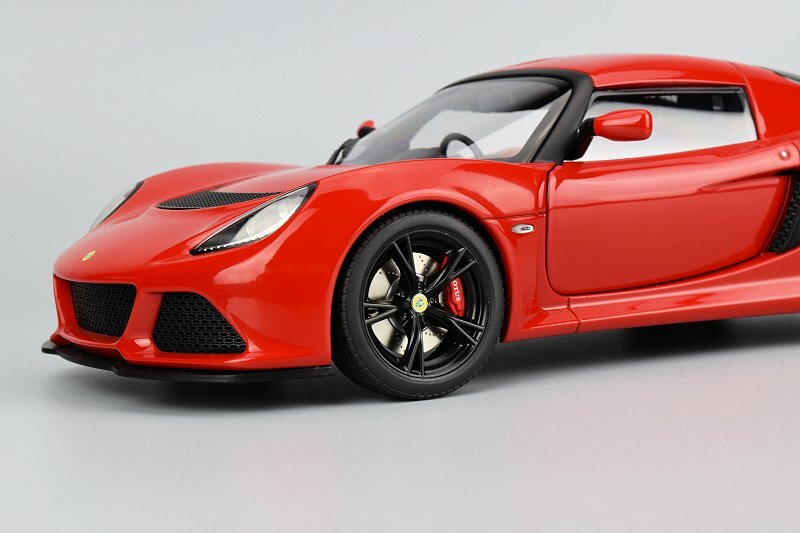 Don’t believe they produced the Exige S in diecast metal, Exige yes.